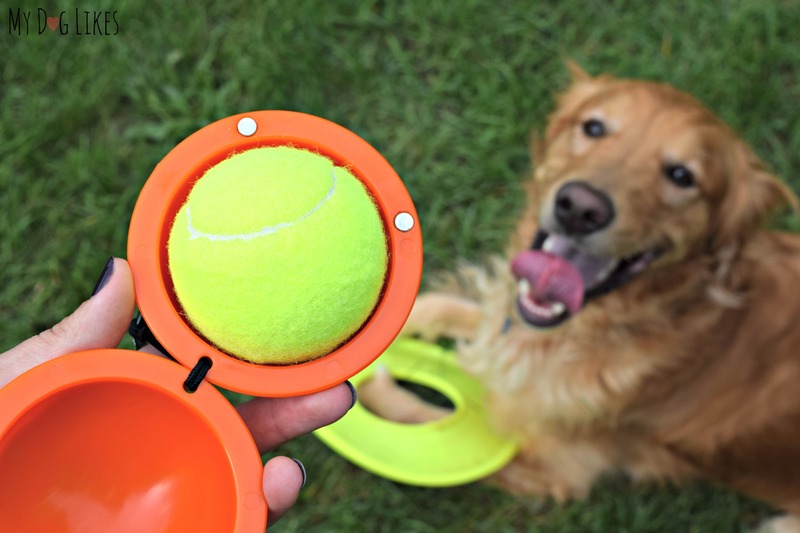 Fetch It Case Review - Hands Free, Slobber Free Tennis Ball Holder! Fetch It Case Review – Hands Free, Slobber Free! And what’s not to love? They are lightweight, high bouncing and far flying. They are also the perfect size for catching and carrying. 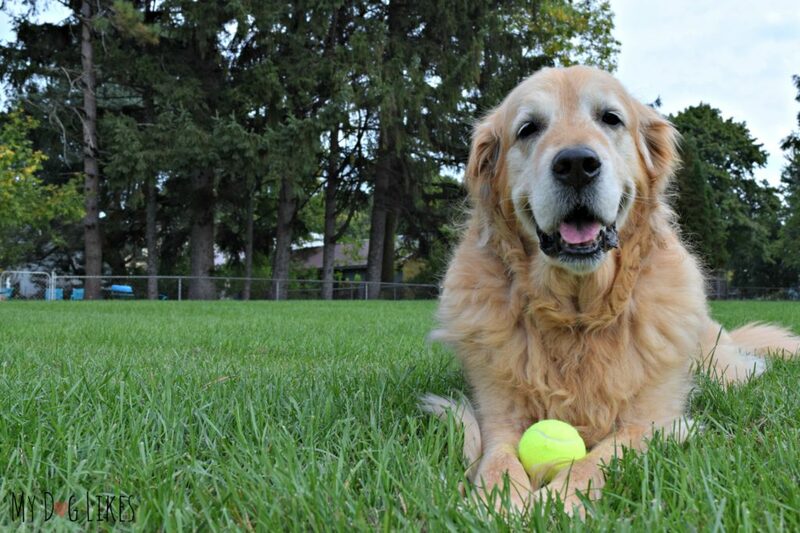 Even if your dog is not a fetch fanatic (like our Charlie) chances are that he or she is still a fan of tennis balls. They have just the right amount of “squish” that is extremely satisfying to chew and compress. Harley “playing” with a tennis ball in his own way! The felt that covers tennis balls becomes absolutely disgusting during a play session. You know what I’m talking about – and nobody likes to carry around a wet, slimy and dirty tennis ball! 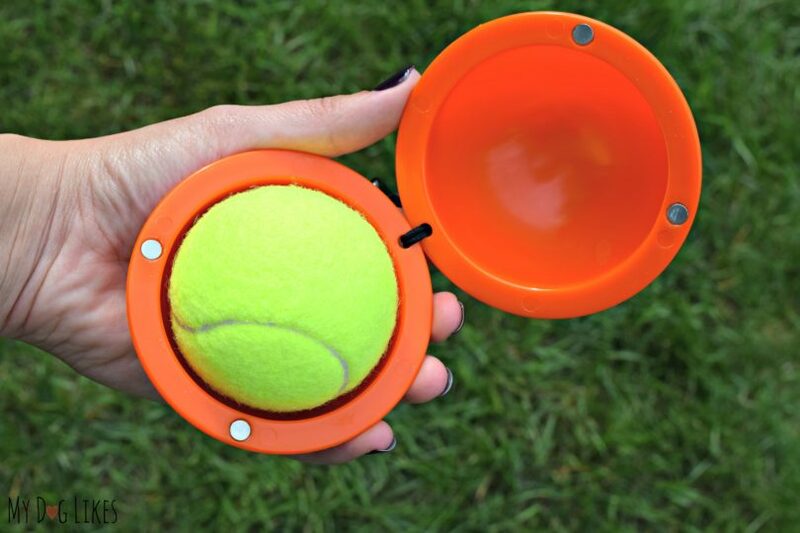 The Fetch It is a durable case that holds a tennis ball – so you don’t have to. 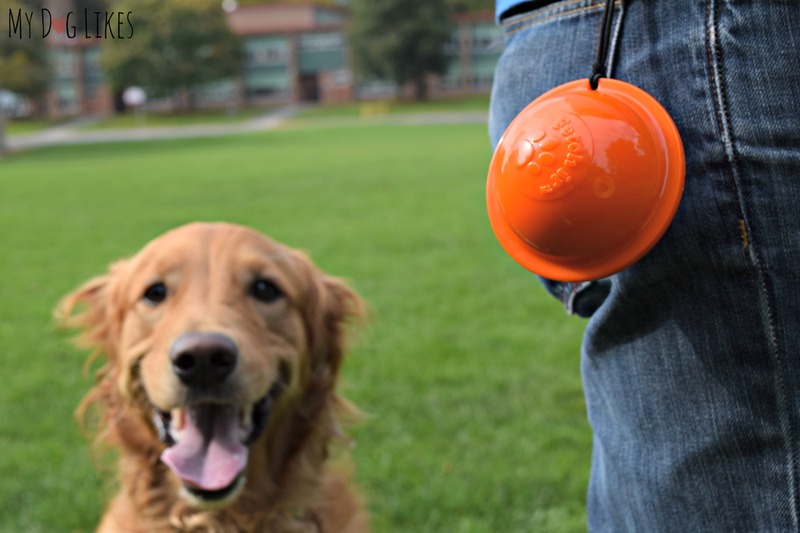 No longer will you need to carry around a slobber covered ball after playing fetch at the park! Just toss it into your Fetch It case and be on your way. The Fetch It can be attached to your leash, belt loop, dog walking bag, or whatever else you are carrying with you. The key thing here is that it doesn’t have to go back into your pocket or hand for the rest of the trip! Fetch It recently sent over a sample for us to test out and share with our readers. The Fetch It seems pretty simple on the surface but it has some really clever design features that make it even more practical and easy to use. The shell of the Fetch It case is molded from a tough ABS plastic. It is clearly built to last and would not be harmed if you dropped it or stepped on it. We also loved the bright orange coloring which makes it easy to spot should you set the Fetch It down in the grass during play. Last but not least, the product is completely washable. If it gets smelly, stinky or gross, just give it a quick rinse in the sink! 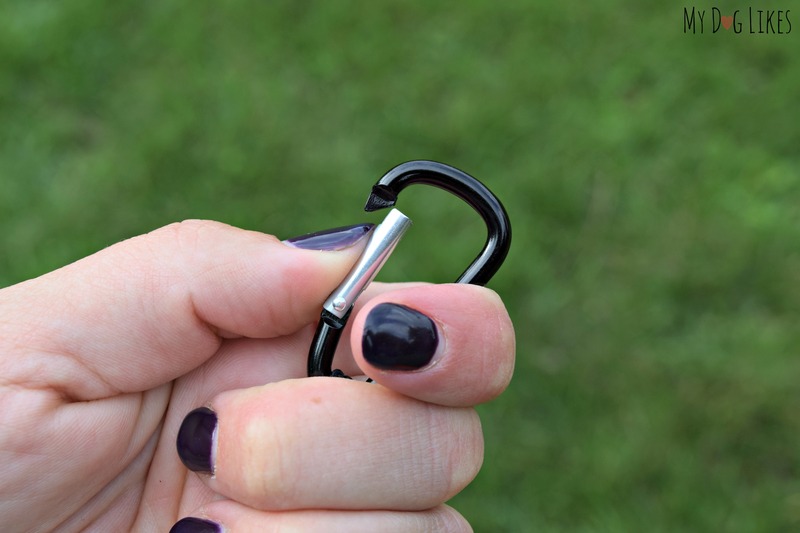 The Fetch It case is attached to a small carabiner making it simple to clip onto to a leash, bag or whatever else you bring along on daily walks. We also love this feature because it helps assure you will always have a ball with you should the opportunity for fetch arise! I have even tried attaching to my belt loop and found that it wasn’t at all obtrusive on my walk. Two strong magnets are embedded into the edge of the case to make it align and close on its own. This is great because you don’t need to fumble around with a clasp, and even though it is technically 2 separate pieces, you don’t have to worry about lining it up either. 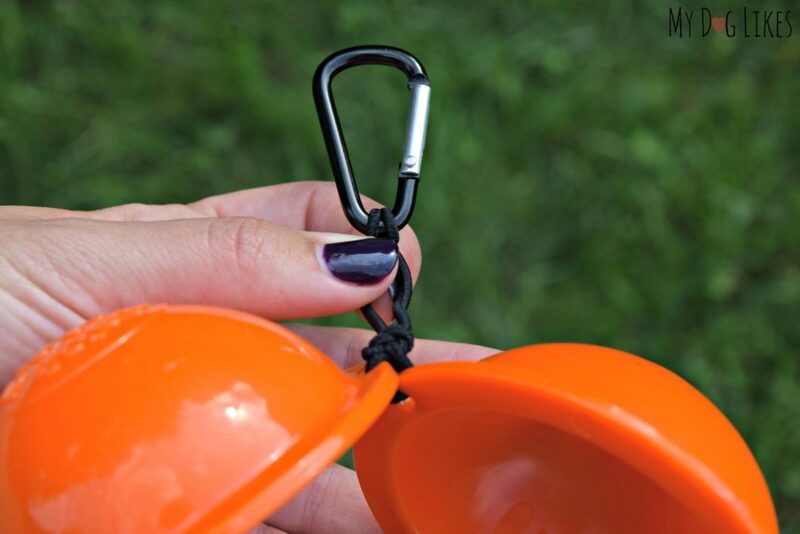 The string that is attached to the carabiner is also looped through one end of the case and acts as a built in hinge. Bonus! For fetch hounds like Charlie, the fact that they have thrown in a tennis ball in is just the icing on the cake. You can simply never have enough in your stockpile! We were really pumped when our Fetch It case arrived in the mail. Taking it out of the box, we immediately loved the bright orange color and it could tell that it was well made. 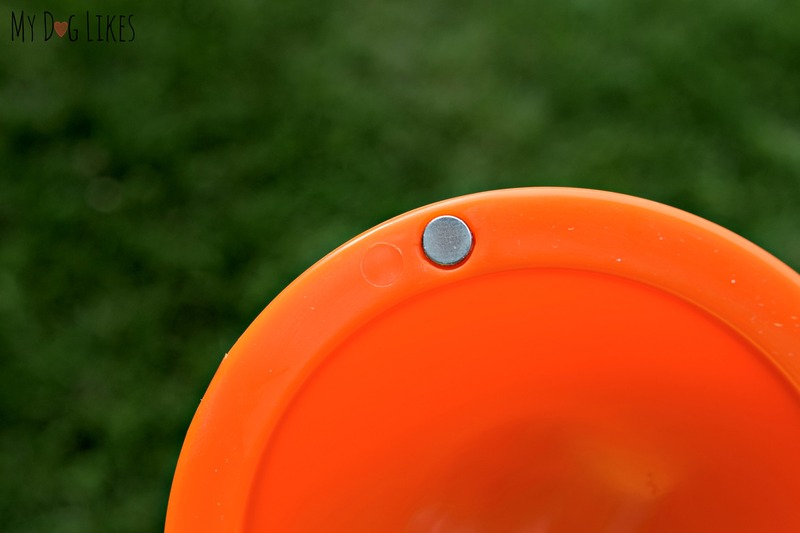 The plastic is tough, durable and clearly built to last. We were also very impressed with the strength of the magnets inserted into the edge of the case. By simply bringing the 2 sides anywhere near one another, they will automatically align and snap together. Eager to test it out, I clipped the caribiner onto my belt loop and we headed right out for a walk. We have talked a great deal about Charlie’s favorite frisbees, but it should be known that he has a similar obsession with tennis balls. We met one of his doggie friends at the park and the two of them spent more than a half hour chasing tennis balls (and each other.) Harley even got into the action a bit! As you can imagine, by the time we were ready to head home this ball was soaking wet. The last thing we would want to do was carry it all the way home in our hands or put it into our pocket! So with our new Fetch It in tow, we simply reached down, scooped up the ball and were on our way! No need to even touch it one last time, let alone carry it! We thought that Fetch It struck a great balance with the strength of their magnets. They attract without needing to be too close, and they remain engaged though the swinging, bouncing and jostling of a walk. On the other hand, it is not too difficult to separate the halves when you want to take out the ball to play. We found that a simple twisting action was actually perfect to separate the pieces. We also liked that the Fetch It case was designed in a standard size allowing you to use it with other kinds of balls. For example, Charlie is a big fan of the Chuck It brand balls because they are so bouncy! We like those balls because they do not have a felt cover that can be torn off and do not split down the middle like a “well loved” tennis ball. 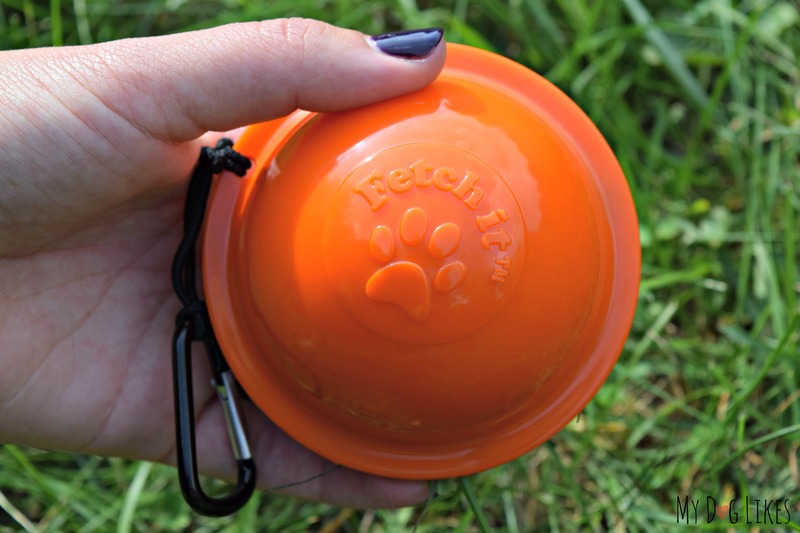 We were happy to see that the Fetch It case easily worked with our favorite ball too! The Fetch It is yet another great lifestyle accessory that makes things just a bit easier and more convenient for pet parents. Solving a problem that you may have never thought about before….but now that you have, will wonder how you ever dealt with in the first place! Not only do we no longer have to put up with carrying a disgusting tennis ball in our hands or pockets, but since the Fetch It can be attached to any leash – we will never forget a ball on our walks. We would highly recommend the Fetch It case to anyone with a ball motivated dog! Want to pick up your own? Does Charlie skin the tennis ball and pop it in half? That is what my dogs do…after so long of fetch they take the ball back in the house thru the doggie door and that is when they skin it. Yep! He loves to skin them when he is bored – That is when we know it is time to head out for some play! That is a great idea for all those tennis ball obsessed dogs out there. We barely touch a tennis ball, but we know how disgusting they can be from our friends. They really do become GROSS in no time! 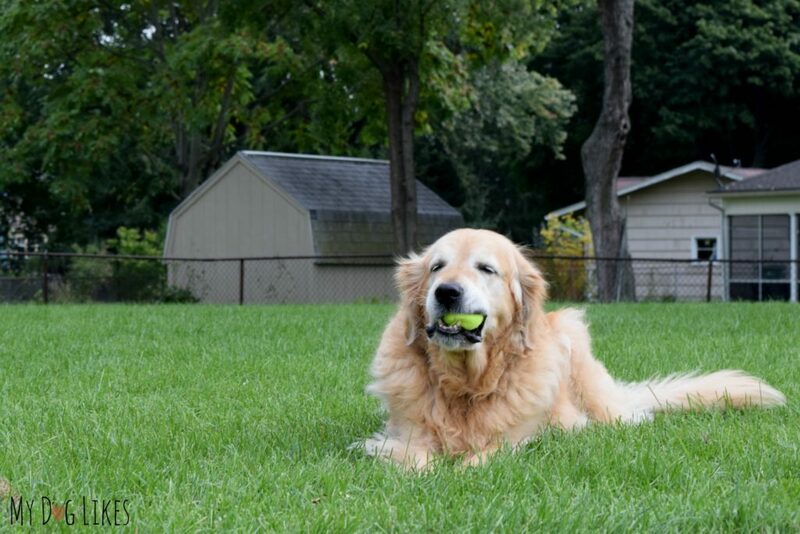 Charlie loves tennis balls, frisbees – basically anything that can be thrown. That dog was born to run! great idea. however, my dental specialist vet, states that it is okay to let dogs play with tennis balls, but to take them away from them when the playing has stopped. chewing on them, is bad for their teeth, it wears down the enamel and the teeth. Thanks for the tip – It makes sense! Tennis balls are definitely not something they chew on often but we will keep that in mind! Awesome idea, now they just have to make a tennis ball that doesn’t pop after a bit of chewing, my 10 week old kelpie runs through them like nobody’s business! This is such a neat little gadget… definitely one of those, “why didn’t I think of that?” things! This is such a great idea. 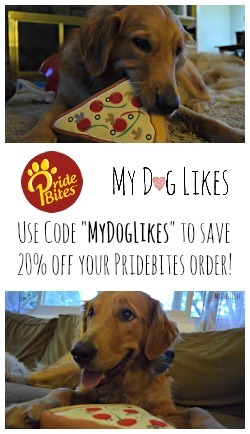 Great for dogs that love to slobber! That looks like something I’d want to try. Those balls get pretty wrecked up. That’s a fantastic idea! My Delia is obsessed with her tennis balls and they get pretty gross. We’ll have to check this out! This is SO COOL! My Bailey would totally need this, she is so ball crazed it’s insane! I can’t believe I’ve never heard of this product before! Thanks for letting us know about it! What a great idea! I just warned my mother-in-law today to avoid picking up the wet mess of Theo’s tennis ball. Amy her favorite thing about tennis balls is not fetching them, but getting the fuzzy yellow stuff off the ball! Haha! But great idea!! I love that it Can be used as an on-the-go water bowl for a quick drink. My dogs love play with tennis balls and would help me out greatly. What is not to like?? I do like the carbiner to clip on belt loops. It could be used to carry poop bags as well. All you need to do is enter your email in that widget and we will send over to Fetch It at the end of the contest! My dog doesn’t like tennis balls (her mouth is too small) & prefers non-ball toys. However, she has a lot of friends who love tennis balls. This looks like a great way to carry them without gross hands. I love that it can be used as a water bowl. I like that I would not have to carry a wet ball. I like that it turns into a water if needed. I had a nice flexible water bowl that I would take on our hikes so that my Tuc could get a drink but he thought it was more important to chew the water bowl. I just love the whole concept…so smart! I think though that I love the carabiner feature the most because that makes it so versatile. I like that its totally washable. I love the fact that it can float in water , we have a lab and they love water we spend quite a bit of time at the lake in the summer. My favorite feature is the Fetch It case has a small carabiner attached making it simple to clip onto to a leash or bag. That’s a great point – it’s nice to be able to “put it away” when they are getting into that destructive mood! I like that it has a clip to make the ball easy to carry to the park. I love the idea that i dont have to handle the wet cold ball ever again! My fav feature of the case is that I can carry our play balls and not get slobber on my hands. I like that it has a carabiner so I can bring it with us to the park! I like that you can use it as a water bowl as well. I like everything about it. I love that it isn’t squeaky, and can keep me from holding a slobbery ball. I also love it can be used for the dogs to drink water out of. I like that it has the clip on it so I can hook it too my backpack. My favorite feature is that I won’t get my hands all dirty picking up slimy balls. That’s the answer to my prayers! Jaxson is a tennis ball nut and this would make traveling with one a whole lot easier! It’s so convenient to have one simply attached to our leash handle now. It is always in hand in case the opportunity for fetch pops up! The belt clip is an amazing feature. I like that you can use it as a quick water bowl. I love that you can use it as a water bowl besides as a case to carry the ball around. That is a really cool feature that we hadn’t even touched on! 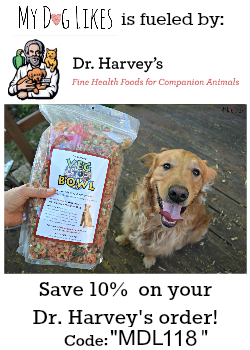 So handy to have a small bowl in case your pup needs some refreshment! I like that you can clip it onto anything. Also neat that you can use as a dog water bowl if needed. I like that it is Compatible with Medium Chuckit! rubber ultra balls. We loved that too – Charlie is a big fan of those Chuckit! balls. That was a big plus in our book too – those balls really are fantastic! I like that it hooks on your belt loop to carry….and no more yucky hands!! I loved that too – it was not obtrusive at all when hanging on the belt loop, and super convenient! The best feature is bending down and picking it up with the case! I hate grabbing onto a slobbery, wet ball so this is a great idea! I like that Clips onto any leash, bag or backpack. Great for walks, hikes, and parks. I like that the Ball with float in water. Awesome for lakes or the ocean. I like that I don’t have to grab onto a slobbery ball. My mom needs this!!! With our trips to the dog park we leave with a wet, slimy ball! This is perfect! Oh, we remember how much Spencer loves his tennis ball!! Not having to touch the drool covered ball! That I don’t have to touch that yucky wet ball. I like that the ball case is held together by magnets, not snaps to fumble with. Though they can not guarantee any dog owner a slobber-free life, it looks like one less opportunity to be slimed. I like that it has a hook to have around without needing to hold it or have it in a pocket. My favorite feature is that it can also be used for a on-the-go water bowl.